Noon N160 Noon Smart Lighting Kit with 1 Room Director 2 Extension Switches and Wall Plates. REFURBISHED GRADE A "LIKE NEW RETAIL READY" Condition has NO cosmetic defects, blemishes, dents, scratches or signs of age. 3.94 x 6.6 x 8.9 in. Yup, we are confident in our refurbishment. Bring the beauty of layered lighting into any room with the Noon Smart Lighting Kit. Includes everything you need to get started with the Noon Lighting System: 1 Noon Room Director, 2 Noon Extension Switches and Noon Wall Plates. Based on your room type, bulb type and light fixtures and your Room Director works with each Extension Switch (2 included) in a room to create beautiful ambience based on layered lighting principles that make your room look and feel its best. Swipe through lighting scenes, control every light in the room or dim lighting levels using the curved glass touch screen of the Room Director. Motion triggers a Night Light feature to guide you in the dark. A learning Vacation Mode mimics your recent patterns to make it seem like you&###x27;re home, even when you&###x27;re not. 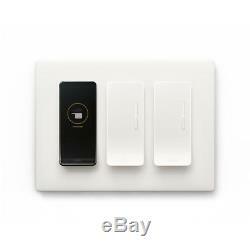 Room Director and each Extension Switch easily replace any light switch and work with the bulbs you already have. Control the lights by app, with your voice or right from the wall. Built-in designer creates 3-scenes automatically based on room, bulb type and light fixtures. Coordinates all the lights in a room to create professional quality layered lighting. Control by app, with your voice or right from the wall. Works with all standard, MLV and ELV light fixtures. Designed for easy DIY installation, neutral and ground wires required, compatible with 120-Volt only. Connects to your home Wi-Fi, no hub required. All our devices undergo a rigorous 65-point physical and technical examination to ensure that we can deliver the highest quality to our customers. As an industry leader in product sourcing and reconditioning, we are expert in providing the best and finest quality products. All our products are sourced from the USA. We grade over 10 million devices each month and only the ones that pass our rigorous quality control with a score of 100% approval are released for the retail market. VIPOUTLET was established to provide consumers the opportunity to benefit from amazing deals on: new, over-stocked, open-box, and refurbished products from the nations largest retailers and manufacturers. Retailers and manufacturers provide products directly to VIPOUTLET to leverage our extensive remarketing channels. If products arrive as open box VIPOUTLET refurbishes products to ensure they function according to the original manufacture's specifications. Every single item we sell goes through thorough inspection processes to make sure it works perfectly. We unfortunately cannot accept payments from accounts located outside of the US and Canada. Your order will be processed by one of our 6 fulfillment warehouses as soon as we receive it. We may contact you for additional verification if needed. We proudly stand behind the quality of our products. The condition of the item you are purchasing will clearly be marked on the listing page. I received my item but it's missing something... This means we messed up a little and we promise to make it right. I received the wrong item... This means we really messed up and we promise to make it right. Feedback Policy We understand that sometimes there are situations where you may not be satisfied with your order/product or its fulfillment. We are sure that we can provide a solution that makes you happy. Unfortunately, once you have completed checkout we are unable to make changes to your order. Visit Our Store For Best Deals. Send it back for free within 30 Days. We've got it all covered. The item "Noon N160 Noon Smart Lighting Kit with 1 Room Director 2 Extension Switches and" is in sale since Thursday, September 6, 2018. This item is in the category "Home & Garden\Home Improvement\Electrical & Solar\Switches & Outlets\Dimmers". The seller is "vipoutlet" and is located in Rogers, Arkansas.